Remember the Baby Connect app? It was SO helpful for the first few weeks when my brain was mush and we were nursing, napping and changing diapers nonstop. 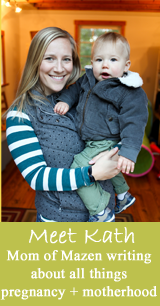 I quickly stopped tracking diapers (there were plenty!) and slowly stopped tracking his sleep. There are two things I still keep track of: nursing and nighttime sleep. 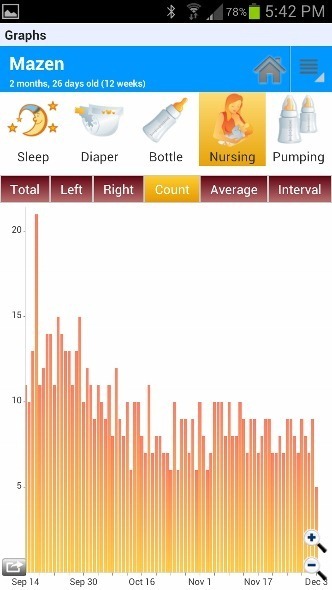 And nursing because I find this data to be important for M’s health – to note trends. But also so I can better predict my schedule and feeding times throughout the day. He continues to nurse for 20+ minutes at each feeding, although I think we may be turning a corner just this week to more like 15 minutes. I’m not sure if we’re on the road to 5 minute feedings, but for the most part it’s OK because we enjoy the time together. Look at that clear drop! Definitely a big drop after a month! This has stayed pretty consistent…hmmm. But from the first graph we can tell that while he’s nursing roughly the same amount of time, his feedings are spacing out because the overall time is less. Which brings us to interval – clearly he is going longer between feedings! And finally – tiny 1-month old Maze! I miss that little snuggler! 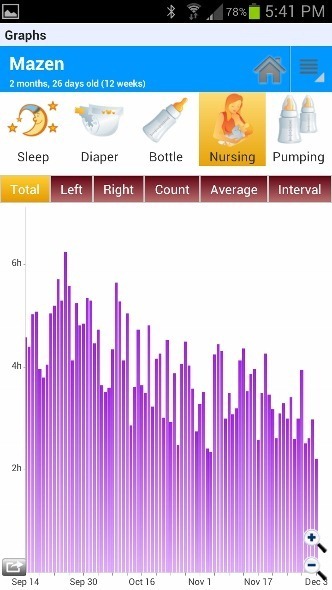 I’m still using the app, but we’re still only tracking feedings and diapers. I prolly don’t need to track diapers, but it came in handy last week when Lucy had her first cold and it was my first week back at work. 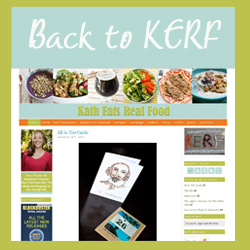 I wanted to make sure there weren’t any big changes in that department! While I am still around during the day to nurse if needed, Lucy’s daytime feedings are primarily from a bottle, which she wasn’t thrilled about at the beginning of last week. I need to do some analysis to see if her overall feeding has dropped like I feel it has. Then again, it could just be because last week was hard on her with the transition in routine and her cold. And I am totally hoping against all odds that my second will be a faster nurser. My girl nursed for 30 – 40 minutes until she was at least 7 months old (usually 2-3 hrs between feedings when she was older, but sometimes only 30 – 40 minutes between feedings when she was littler). I’m hoping it was just because she had such uncomfortable reflux and nursing soothed her (it was one of the only things that did), and not because I pass on some slow nursing gene. Then again, supposedly if your first baby has reflux you have a pretty good chance of having another, so I guess I’ll just have to wait and see. I did enjoy our cuddling nursing time, and felt lucky I had the time to nurse as often as she needed. But I’m not sure it would be as easy to do this time around with an active 2 year old in the mix. I’m hoping finding a really good sling that I can nurse in will help me stay more mobile while nursing #2. Okay – can you tell my pregnant brain is non-stop ruminating about what it will be like to have two? So excited! (And a little bit worried about how successfulyl I’ll be able to make it all work). I used this intensively for 2+ months but found it started to crash – probably due to the amount of data I was trying to capture! With little Reed at 9 days old, I have to say I underestimated what a job breast feeding would be. Wow. 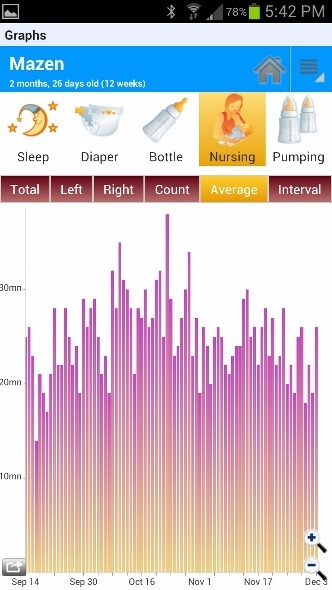 I am not sure I enjoy it yet, but hopefully it will feel less stressful soon…and 20 min nursing sounds great. I think we do 20 min of fussing…then 20-40 min of nursing. Although sometimes I can’t tell if he is swallowing or just sucking. Oh my. Do you know how many oz. he’s eating now? Typo in 1st paragraph…I think much is supposed to be mush? 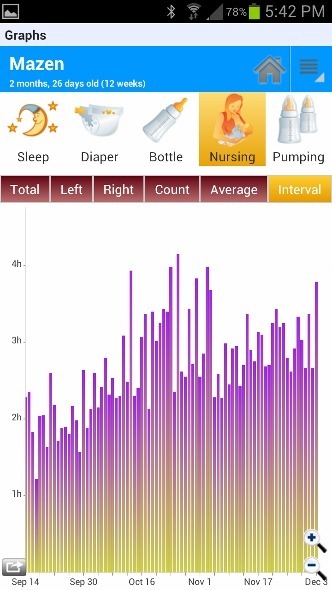 I stopped using the app because it was stressing me out…as a Type A, I think I was relying too much on hitting the “right” number of feedings and diapers. 🙂 But for those first weeks, it was absolutely amazing. Woah. That’s really cool to see it all charted out like that! I love to see my graphs all laid out for me like that…. except it makes me realize that I’ve changed about a thousand diapers (and the husband has changed about two 😉 ) even though I don’t keep track of them all……. My nursing sessions have gotten super short and I’m always finding myself wishing he’d eat longer so we’d get more snuggle time!! !